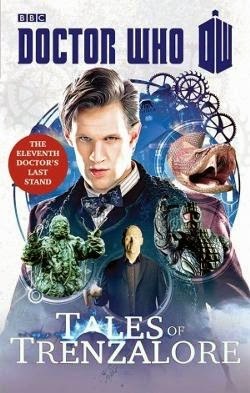 Despite the cool cast and premise I don't have it in me to pay much further attention to SyFy's "Battledogs", so instead you get a semi-spoilery book review of "Tales of Trenzalore: The Eleventh Doctor's Last Stand". Aren't you lucky? I'm actually MOST excited about the "Eighth" Season of Doctor Who which premiered two days ago... but you may not have seen it yet. Thus... this. It's four short stories about the town called Christmas on the planet Trenzalore: a low-tech land of perpetual snow and darkness with pleasant inhabitants. (Not unlike Canada, really.) Trenzalore has been under siege for nine centuries, yet remains steadfastly defended from alien invaders by an alien invader called the Doctor. Each anecdote is worthwhile, quick jaunts in the impossible life of the 1500-year-old Time Lord forced by conscience and circumstance to defend everyone with his wits. In these specific cases, defending them with the added hobbling of a wooden leg, encroaching bodily decrepitude, and a Truth Field that demands total honesty. Justin Richard's 'Let it Snow' provides a heart-warming story of frozen Martians and avalanche. 'The Dreaming' by Mark Morris offers the mental menace of the Mara. Paul Finch brings an explosive tale of tundra and plastic bullies in 'Strangers in The Outland'. My favourite was 'An Apple A Day' by George Mann. It features the carnivorous avocado known as the Krynoid, whose origin story 'The Seeds of Doom' from 1976 was, for me, most memorably horrifying. Second item of good news for me: George Mann is the author of 'Engines of War', a Doctor Who novel I ordered a month ago sight unseen. I'm pretty much bound to love it!